Requires pharmacy license to purchase. The CircuFlow Lymphedema Pump has been designed to treat chronic lymphatic and venous disorders of the lower extremities and chronic lymphatic disorders of the upper extremities as conveniently as possible, by preventing the pooling of blood in a limb. There are three different CircuFlow Pumps available. User-friendly design: These pumps are designed to help move bodily fluids in the correct physiological direction to prevent pooling in the limbs, as treatment for deep vein thrombosis (DVT). They feature a use indicator, which monitors the patient's use and compliance. They also have an auto-shut off, ensuring user safety. The vacuum mechanism removes air from the multi-chambered compression garment (not included) to make it easier to remove. Medicare reimbursable: This lymphedema pump is FDA and CE approved, and the costs can be recovered from Medicare. 5150: The device’s cycle time is 15 seconds per chamber totaling one minute, with a rest time of 12 seconds. Pressure gradient is set at 7% from distal to proximal, and the pressure range is between 20 – 80 mmHg. This sleek device weights in at just 5.5lb and features easy-grip handles for easy movement. 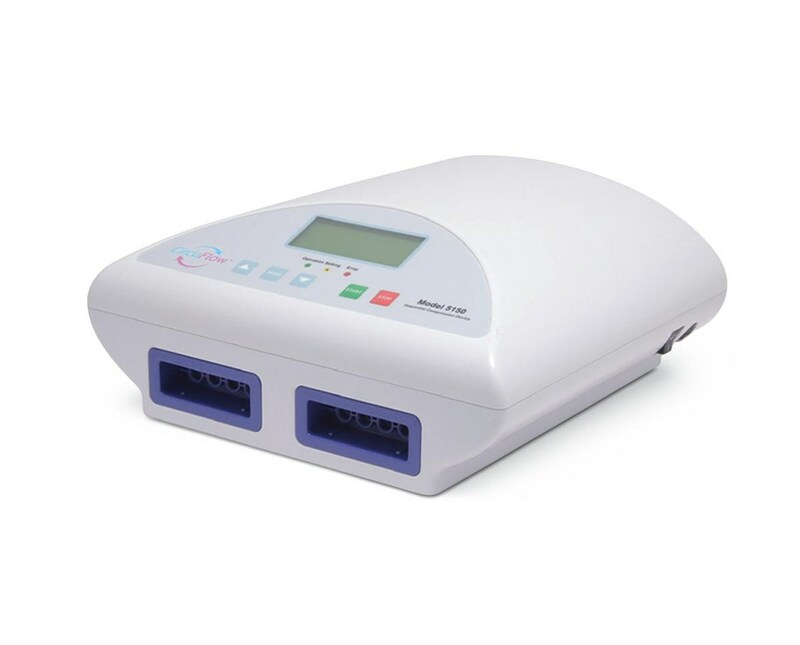 This pump utilizes a graduated inflation/deflation cycle, which is therapeutic and comfortable for the user (Medicare reimbursement code E0651). 5200: This compression pump allows patients the freedom of treating themselves at home. This model uses intermittent gradient sequential pressure, which, when applied through the garment's chambers, increases blood flow andclears extracellular fluids. It has two operational modes: a gradient mode where a maximum pressure is administered contantly, and a pressure mode where the pressure of each chamber can be set individually. This mode also allows the sure to skip certain chambers and customize both the pressure and cycle time, providing personalized treatment. 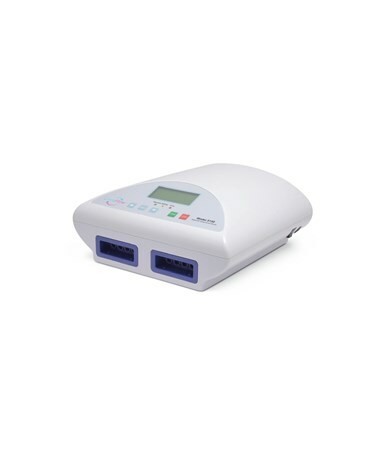 The pump features a lock to prevent settings from being lost (Medicare reimbursement code E0652). 5208: This pump features a 4" x 1" digital LCD screen, which provides easy access to essential set up information and real-time pressure readings for the home user. The 5208 device uses intermittent gradient sequential pressure applied through multi-chambered garments to increase blood flow and provide extra cellular fluid clearances. It offers two therapy modes: the uncorking mode which mimics the process of manual lymphatic drainage, and the focus mode which concentrates on areas of the limb most affected by Lymphedema Fibrosis. The pressure and cycle time in each individual chamber can be set individually, providing personalized treatment to the areas that most need it (Medicare reimbursement code E0652).